Nokia (s nok) isn’t ending its year of smartphone reinvention the way it had hoped, instead reports today indicate that its E7 handheld won’t ship on time. Instead of delivering the new Symbian device in 2010, Nokia has pushed the date into early 2011, says Reuters. This marks the second issue with Nokia’s new flagship line: N8 deliveries slipped into October for many consumers who expected to receive them the month prior. With each miscue, Nokia opens the door for competitors to usurp leadership in the smartphone market — in actual sales and in peoples’ hearts and minds. The delay of Nokia’s E7 isn’t likely to have any direct financial impact on sales revenues because the E7 was always slated for the end of the year. Of course, that means Nokia won’t gain benefit in terms of boosting the ASP, or average selling price, of its handset portfolio, which last quarter was €65 (US $91). The real potential issue here is one of Nokia’s execution as the leader of the smartphone market. According to a Nokia spokesperson statement given to Reuters, the delay is “to ensure the best possible user experience,” which is admirable. Considering the recently released Nokia N8 is the basically the same phone, what does the E7 delay say about the user experience of the N8? Given that the devices are far more similar than they are different, and Nokia is delaying the E7 to improve the user experience, it’s not unreasonable to think that Nokia knows it’s flagship line is lacking. My own hands on with the N8 shows an amazing bit of hardware: a beautiful touchscreen combined with arguably the best imaging found in any smartphone today. But the user experience is still muddled and the web browser — a central application that should excel given the importance of the mobile Internet — is essentially the same as it was on prior Symbian S60 devices. That is to say: many will find the browsing experience in Symbian to be sub-par when compared to other smartphone platforms. Nokia has plans to make improve the browser and Symbian as a whole, however: today at the 2010 International Mobile Internet Conference in Beijing, Nokia senior manager Gunther Kottzieper reiterated a software update in the first quarter of 2011 to address issues. Kottzieper also outlined plans for Symbian phones to gain faster CPUs and improved graphics in the first or second quarter of 2011, to later be followed by dual-core processors. But Nokia’s challenges don’t lie within its hardware, and even if they did, such new dual-core chips aren’t expected in devices until 2012. No, Nokia understands that its mobile platform still needs help: it basically admitted that with the reason for the E7 delay, unless of course, there are production problems, in which case, that’s what the company should have said. Regardless, Nokia may still be the smartphone leader in terms of sales, but the latest admission of user experience issues shows that it’s fast becoming a follower when it comes to smartphone software. And in today’s world it’s the software that counts. The best hardware in the world won’t fly off shelves nor attract developers if consumers don’t want to use the device’s software. Nokia has had more than enough problems with their N8, and of two evils being late with at good product is definitely to prefer rather than being early with a bad product. Sure, the E7 and N8 are more similar than different. So are the iPhone and an old Startac. They are both mobile phones and both do what people expect mobile phones to do. Extending that concept to say that a qwerty slider is like a keyboard-less touch device says more about your ability to discern differences than it does about Nokia’s code base. This difference is EXACTLY why Nokia built two different devices; some people like a physical keyboard and others don’t care. BTW, just because Nokia didn’t spell out WHY they are delaying doesn’t mean you can arbitrarily choose the reason. Having used a developer E7 for some time now I find it a great device for someone who uses e-mail constantly. I found nothing in the UI or software that I’d call a show-stopper. No, the browser isn’t as fast as Android’s, but it also hasn’t caused me any problems or prevented me from visiting any sites and it certainly wouldn’t be cause to switch devices. 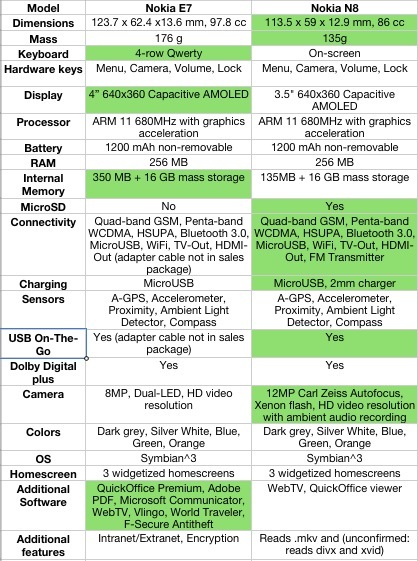 Add to this the fact that the speakerphone audio is far superior to its competition and you have a great work phone. You did not mention the complete Reuters report. Nokia found some issues with the materials it used to manufacture the E7 and delayed release so this could be addresses and corrected. You also do not mention the built-in security on the E-7. If I recall correctly you did not seen to have used the N8 very long and kept comparing the N8 to the Google Nexus One, which I think has been discontinued. I find your reporting generally not objective. Sorry Paul, I just looked at the Reuters story I linked to and see no mention of the materials issue you’re pointing out. You’re right in that I didn’t mention the built-in security of the E7 – mainly because I don’t see what it has to do with this post. As far as the N8, I had it as long as Nokia would let me keep it and used it for the entire review period. See entry on nokiausers.net for December 14th. Appreciate that tidbit, Paul. I’ll definitely take a look – thx! I think you’re reading far too much into a minor delay in delivering this device. Elop has only been in charge a few months and the current crop of Symbian devices were planned well before he took over. 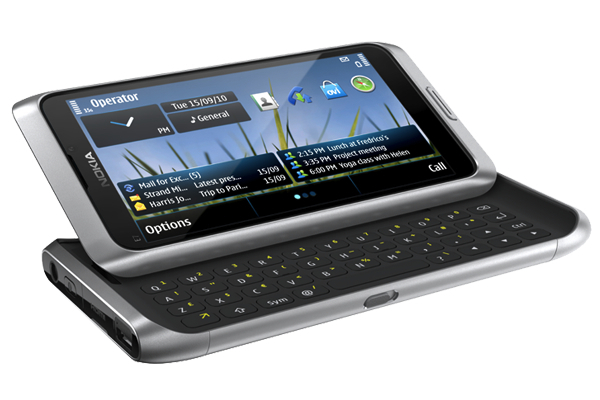 The E7 despite its name and billing as the next Communicator is really only a variant or the N8, C7 & C6-01 and as such it’s not a huge loss that this devices is a bit behind schedule, if no Symbian 3 devices had launched I’d be far more concerned. One of the resent articles I’d read stated that Elop was changing the way Nokia unveils new devices so that a new product is in users hands only weeks after it is announced instead of the months that it currently takes. I think if it hadn’t been for this change the N9 would have been announced at the Meego conference when it clearly isn’t going to be ready to sell till maybe April next year. Nokia tends to bundle in extra software with E-series devices. These include encryption, VPN, office apps and a better calendar. Maybe it’s one of these changes that’s not quite right yet? One last thing. Where are all the white iPhone 4s? APS, you could be right in terms of reading into things too much. Hard to say with vague statements that don’t really explain the exact reason for the delay. And I would applaud any effort that helps Nokia launch devices sooner after they’re announced, if not at time of announcement. But any changes to that approach really don’t explain the E7 since it was already announced. Hopefully, this gets sorted out quickly and the E7 ships sooner rather than later. As far as the white iPhone 4 – we’ve covered that a number of times, not to mention the “deathgrip” signal issues, so don’t think they’re exempt from criticism by us. In terms of managing delivery and expectations, I think Apple does a far better job than Nokia, but of course, that’s debatable. I’m not sure what the problem is here, Kevin. Do you think it’s better to delay a release because of an identified issue or chuck it out anyway, call your customers idiots then have to apologise and offer a free case to correct a glaring hardware fault? I think I know which is the more sensible approach. As for software, what more do you want? Nokia have just committed to a series of firmware updates over the next 12 months which will correct the minor annoyances in the UI and the browser. Not sure what else you expect them to do. See, this is the thing: the hardware is top notch, the OS – not the UI, let’s not confuse the two – is excellent and the feature set beyond compare. All that remains is improving the UI and when that’s done what else will there be to complain about? I’m sure some people will find something. The rest of use will just welcome increased customer choice. “Do you think itâ€™s better to delay a release because of an identified issue…” Exactly, what is the identified issue, Mark? That’s really the crux of the point I’m trying to make here. If there is a user experience issue in the E7, it’s reasonable that unless it has to do specifically with one of the very few differences between the E7 and N8, it’s also a problem with the N8. Yet that device has shipped, no? I agree with you that Nokia has announced upgrades and improvements, along with a timeline for them, but really, isn’t that a non-event? That’s *expected*, so Nokia doesn’t really gain anything by saying that they plan to make things better. They’ve said it before and it would be news if instead Nokia said it wasn’t going to improve the browser and other software bits. And if anything, the lack of delivering things on time is more concerning when it comes to those software improvements, so I hope they meet their stated goals there. I’m glad you brought up the point about the top notch hardware and OS but a UI that needs improvement. No argument, but I don’t know anyone that thinks Android’s UI is top notch either. Yet as a platform it’s selling just as many devices as smartphones that run Symbian – in just over 2 years, no less. At the end of the day, there is plenty of room for multiple platforms and companies – and for customers that want device A over device B, I say, to each his or her own. But I question if Nokia will ever again dominate the market like it once did. Apart from that there are a few minor bugs in the software which I would expect in any phone. That’s it, all of which are being corrected by the firmware updates mentioned so I don’t think it’s anything catastrophic on that front. From what I gather it’s a durability issue and if I was a betting man I would say it’s the overly stiff release mechanism on the E7’s slider. In retrospect, you’re right – if Nokia state a release date then they need to achieve it. That’s poor marketing, not poor design though. As for the point about Android. I think that’s more to do with the generous press coverage Android and iOS gets which tends to focus on the positives rather than Nokia’s coverage which is at the opposite end of the spectrum. Nokia have rather been the architects of their own destruction but even if you don’t want them to fail I suspect there are a considerable number of your peers who don’t share that view. Good thoughts, Mark, and I hope that the software updates bring the device up to the high standards that the hardware deserves. If this delay leads to improvement in user experience as Nokia stated than people would forgive the delay and Nokia’s image may even improve. However if this delay is due to production issue than Nokia’s image would be some what impacted. However this would still be better than shipping a product with quality problems just to meet a stated timeline in which case Nokia’s image would take a nose dive.